We rented white folding chairs from AC for our beach wedding ceremony, as well as a pipe & drape setup for our DIY photo booth. The company was very responsive throughout the process, everything was delivered and set up promptly, and the price was unbeatable- the cost of chair rental is pretty ridiculous when you factor in setup & delivery, but I quoted with at least 10 other companies and AC beat every single one by at least $200. It was worth every penny to not make my guests stand up on the hot sand during our ceremony! 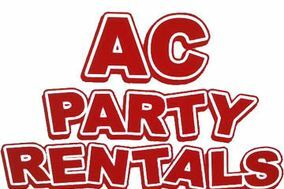 AC Party Rental: Neither exceptional nor bad at what they do.